CASC Certification is a significant endorsement of the skills and knowledge that are needed to effectively manage an ambulatory surgery center (ASC). We've already explored what it means to be CASC Certified and how to maintain your certification, but today we pause to consider the credential itself, the jobs it can lead to, and ask "Is this the right choice for you?" CASC certification isn't easy. Not everyone qualifies for the exam and, because extensive preparation and a wide breadth of knowledge on both business and clinical topics are required, not everyone will pass. But if you are motivated to advance your career, achieving the credential can provide the boost you need. The CASC process is not simply about having a new set of initials by your name, but is an ongoing learning program designed to keep you abreast of industry changes. Maintaining your certification by completing the required number of AEUs (Administrative Education Units) will keep you on the cutting edge of outpatient care. Executive management of an ASC or an ASC management company – CEOs, Vice Presidents and others – who wish to stay current with industry developments and knowledge, add credentials to their resume and cultivate deeper professional interactions with CASC-certified peers. ASC administrators or department heads – such as a DON, BOM, etc. – who are interested in learning about other areas of responsibility and obtaining credentials for career advancement. AEUs will strengthen their existing knowledge base in a wide range of areas. Successful manager candidates from other fields who wish to transition into ASC management and/or can benefit from CASC knowledge in their current role – for example, health information technology (HIT) product development. Check out the CASC Candidate Handbook for information about eligibility and testing. Also, review the list of current qualified AEU providers, including SourceMed. Why should I become a CASC? CASC certification can open new doors, both with your current and prospective employers. With a broader, holistic understanding of how ASCs operate, your opinion and skillset become more valuable. If you are not already in a management position, passing the CASC exam demonstrates your commitment to becoming a reputable ASC leader. Having this credential will set you apart from non-certified colleagues and demonstrate that you have relevant industry knowledge and a willingness to learn. Consideration for future advancement may be enhanced. Gaining your CASC certification does not necessarily guarantee a pay raise since salary increases depend on a number of other factors like the financial health of the facility, budgeting constraints and even the overall economy. However, in any situation, committed and knowledgeable employees bring greater value to their employers and are more likely to be rewarded. The Ambulatory Surgery Center Association (ASCA) reported in 2012 that CASC-certified individuals earned 19% more than non-certified administrators. And it's important to remember that your capacity to negotiate can affect eventual pay levels. With the CASC certification, you'll have more ammunition. If I am not already in ASC management, can I realistically qualify for and pass the exam? The answer is yes. But a number of the content areas covered on the exam combine both education and experience – two examples are Legal/Regulatory and Delivery of Patient Care – which can be challenging to master without any practical experience. Leading up to the exam, carefully review the subject matter and, if you feel you're lacking in any specific area, focus your studies on that subject to increase your chances of passing. Also, don't underestimate the knowledge you have acquired through education and also by working in non-management roles for organizations other than an ASC. After interacting daily with ASC customers at SourceMed, I contemplated taking the exam for over a year before I applied. I had reviewed the eligibility criteria and determined that I met the baseline requirements, but wanted to be certain that I would be accepted as an exam candidate. At that time, it seemed that obtaining one more year of management experience would ensure my eligibility. When I finally applied, I was surprised to discover that my experience as an Implementation and Training Specialist held more value toward exam eligibility than my more senior Manager and Director positions. The points assigned to the Specialist job were greater due to the work that I did in that role – where I interacted directly with ASC staff on software implementations and developed ways to accommodate process flow and patient experience into the software for better staff adoption and satisfaction. 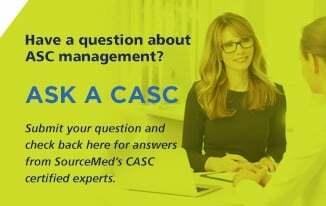 In my next blog entry, I'll explore how the CASC certification has been beneficial – both to me and to our ASC customers – in a nontraditional CASC role in the Client Services department at SourceMed. 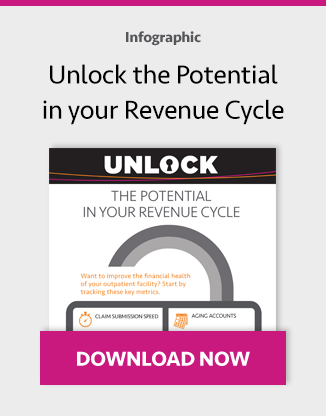 Are there any pressing ASC management issues you need help navigating? Submit your question in the form on the right and I'll respond in a future post.